ROBERT N. ESSICK is a coeditor, with Morris Eaves and Joseph Viscomi, of the online William Blake Archive. MORTON D. PALEY’s most recent book is Samuel Taylor Coleridge and the Fine Arts. He is currently on a study of Blake and George Romney. 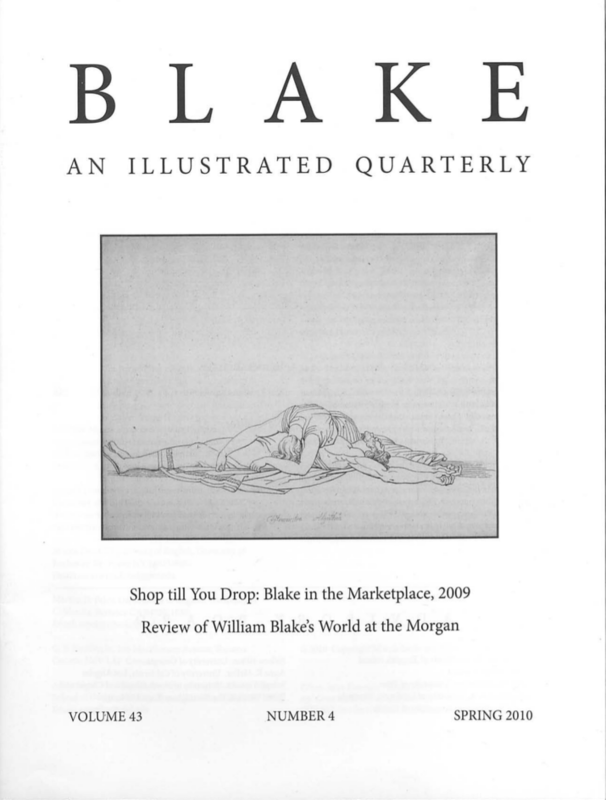 BLAKE/AN ILLUSTRATED QUARTERLY is published under the sponsorship of the Department of English, University of Rochester. Subscriptions are $60 for institutions, $30 for individuals. All subscriptions are by the volume (1 year, 4 issues) and begin with the summer issue. Subscription payments received after the summer issue will be applied to the current volume. Addresses outside the US, Canada, and Mexico require a $20 per volume postal surcharge for airmail delivery. Credit card payment is available. Make checks payable to Blake/An Illustrated Quarterly. Address all subscription orders and related communications to Sarah Jones, Blake, Department of English, University of Rochester, Rochester NY 14627-0451. Back issues are available; address Sarah Jones for information on issues and prices, or consult the web site. Cover: John Flaxman, “Behold this proud oppressor of my country.” Courtesy of the Morgan Library and Museum. Accession no. 1975.40:2. See the review of the Morgan exhibition, p. 149.